General PC Problems and Repairs. 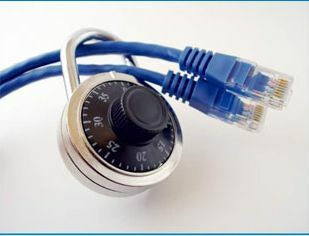 Networking Services, Wired and Wireless, Security and more. Point of Sale and retail services. Server Service, Custom Built and Repairs. 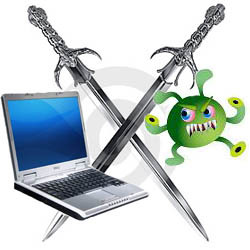 80% of our customers have a virus and dont even know they have it. You bring your computer to us. We will service/diagnose it and have it back to you within an average of 3 to 5 business days (Data recovery can sometimes take longer). Most cases are corrected with a software tweak however others are not. Whatever your case may be... CompuMedik will diagnose your problem and give you a Down Home Honest Suggestion on the best way to fix your problem. Critical Windows updates provided by Microsoft will be installed. NOTE: It is company policy to correct your issue in the shop before discussing the parts you need to prevent misdiagnosis. Due to the nature of PC's we can't guarantee we can fix it unless WE DO. Our A+ certified staff is trained to call you with options on your repair that is APPROVED by YOU! If you can't afford the repair you can simply pay the labor charge... no other fees period (We simply undo our work) . You are however expected to pay the diagnostic/labor fee of $65. Whatever your computing needs may be... we can help. We realize unhooking that computer can be overwhelming in some cases which is why we offer the choice of coming to you. Don't worry about the hassle of lugging around that heavy pc when you can rely on our professional staff to arrive at our appointed time and ready to correct your problem. We'll diagnose the problem, give you an estimated time of repair and your cost options. Most jobs can always be completed within one hour. However, if for some reason we can not... we always offer to return the PC to the shop for a more thorough repair (see below). The choice is yours. In order to prevent you from having a high service bill we offer to return your PC to our shop for repair. You will not endure any hourly rates while your pc is in the shop. Onsite calls are always handled first while in the shop and we can get a more thorough check while doing so. Once the computer has been repaired we call and reschedule a return trip as which our hourly rates continue on. Most onsite service orders can and are completed within the one hour fee making your total cost for labor at $100.00. We drop $10 off the charge if you pick up your system at our shop..
We provide memory and hard drive upgrades for laptops. Since a network is normally not a movable object, most networks will have to be serviced onsite. Call us today for an estimate or see our Networks Area for a more general idea. Due to various reasons CompuMedik, Inc CAN'T guarantee you won't get an illegal operation, blue screen error, or some other fatal software error. Such software errors are in the millions and happen to US ALL! They are often related to software corruption in one form or another or perhaps a driver for a printer or scanner.. Even programs running in the background can keep Windows from restarting or shutting down properly. Perhaps you can't run Scan disk or Defrag (No Big Deal... Microsoft has about 2,000 articles relating to these type of Shutdown/Defrag problems). CompuMedik, Inc can offer you a solution, however it is diagnosed and/or solved at our normal In-Shop or On-Site fee. 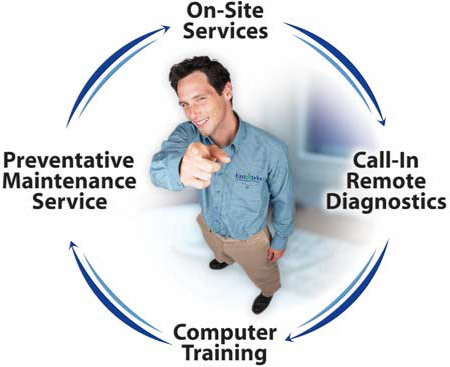 We do offer to re-diagnose your problem In-Shop at no extra fee up to 30 days from your time of service! In the event CompuMedik has misdiagnosed or repaired your system: labor will be covered under warranty and replaced parts are returned and/or replaced with a difference of price when/if needed (No refunds unless credit is due)! and we will be gladly to help you. Some problems we can fix over the phone and some we cant fix over the phone and will require a service call.